If I have a signature dish, it’s this one. I’ve been making it for more than a decade, and it’s still my favorite dove recipe. 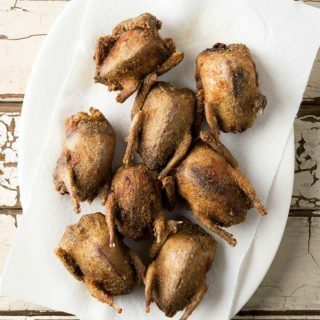 Super simple, this lets you get all primal with your Labor Day bag of fat, juicy doves. Why? Because you pluck ’em, gut ’em and then grill and eat the birds whole. Not only does plucking make the bird look nicer — like a little baby chicken — but you also get to eat the legs, which are fantastic, if a bit small. I normally leave one digit on the wings, but you don’t have to. After that, this recipe is stupid easy: Oil ’em up, salt, stuff the little cavities with fresh herbs, grill and then paint the doves with bacon fat (or duck fat), and sprinkle with smoky Spanish paprika. This is a really easy dish to make, but you do need the bay leaves and fresh sage, and Spanish smoked paprika is important to this dish. Many good supermarkets offer it, and you can also buy it online. If you can't find smoked paprika, regular sweet paprika is OK. Figure on 2 doves per person for a light lunch or an appetizer, or 3 to 6 for a main course. 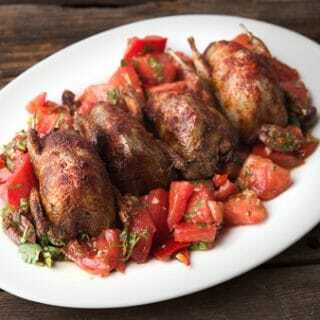 If you don't have access to doves, squab is a great alternative. You could also do this with teal ducks, too. Coat the doves with olive oil and salt them well. Stuff each cavity with sage and a bay leaf. Get your grill hot and clean the grates. Set the doves breast side up and cook them over medium-high heat, with the grill cover closed, for 6 minutes. Open the grill cover and turn the doves over so the top of the breast is wedged between grill grates. Paint the birds with some bacon fat. Let them cook this way for a minute or two, just to get a little color. Turn the doves on their sides and grill for another minute or two — for each side. Paint with more bacon fat. Dust with the smoked paprika and the black pepper and move the birds to a platter. Let them rest for 5 minutes. Eat with your fingers and serve with a Rioja red wine, a California Pinot Noir or an Italian Barbaresco — and a bowl to put the bones in. A simple tomato salad is a good accompaniment, as is a loaf of crusty bread. 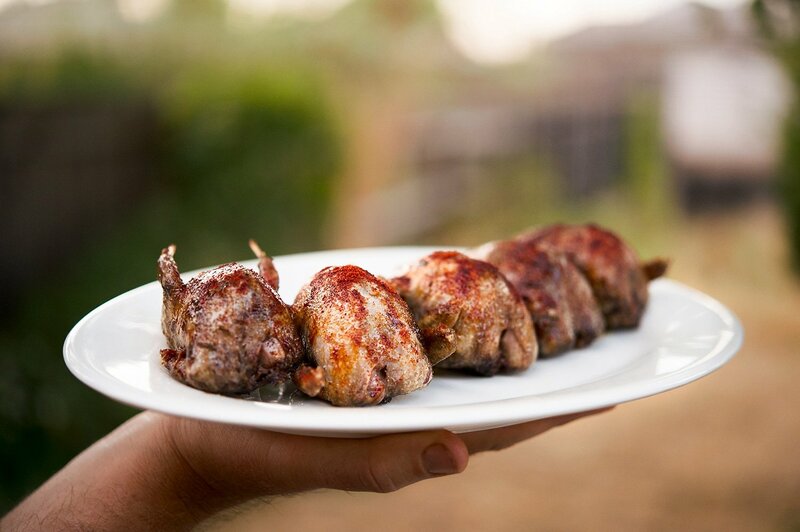 Another grilled dove recipe I love is Grilled Doves with Blueberry BBQ Sauce. 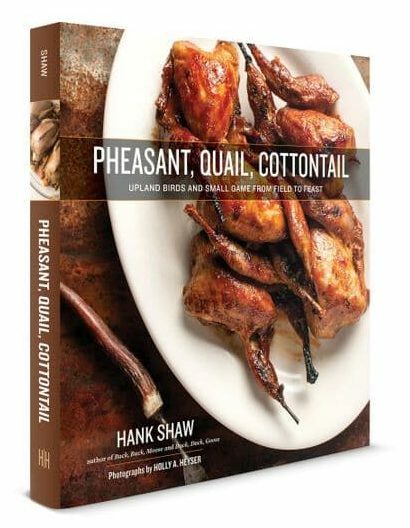 Explore the largest selection of dove and pigeon recipes on the internet, right here on Hunter Angler Gardener Cook! Labor Day dove dinners in Pennsylvania is a traditional treat. This recipe was easy and delicious and made “believers” of my friends that have never tasted dove. My wife and I really enjoy this recipe. However, I shoot mostly Eurasian doves and, since they are much larger than mournings or white wings, this timing doesn’t work. I would appreciate your timing recommendations for Eurasians. Ed: They are only about 1 1/2 ounces heavier than regular doves, so you need only add a minute, maybe two.